To make it through most days with ease, quick cooking, but nutritious dishes are a must. This is one of those recipes that takes just minutes to prepare and really satisfies the palate. 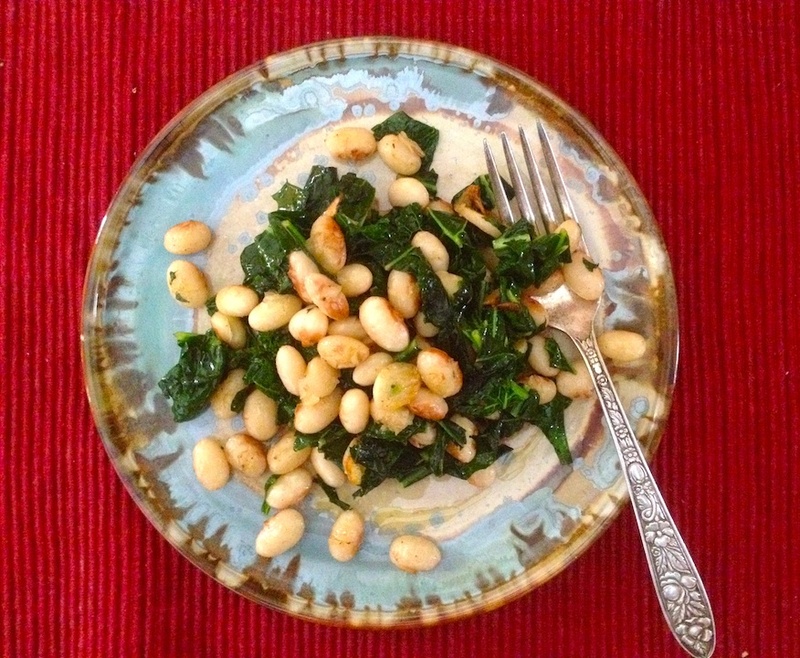 Paired with lots of garlic, and fresh greens, this is a quick cooking recipe that can stand up on its own, or paired with a variety of different proteins. For those folks who enjoy eating meat, try cooking some bacon first, then completing the recipe in the bacon fat, yum! For the vegetarians in the crowd, you can bulk up this recipe with some freshly grated parm or adding some roasted squash. Personally, I enjoy the recipe as is, with maybe a few sprinkles of red pepper flakes to add a little heat. As you will find in the directions below, I always try to soak the beans before cooking. I've mentioned in previous recipes, it's also a great idea to add something acidic, like vinegar or lemon juice. It helps break down the phytic acid and essentially assists in avoiding the "Farty McGhee Syndrome" after eating this dish. A little extra effort goes a long way and your body will thank you for it. I keep my soaking ingredients up on the mantel where it is nice and warm, and then the enzymatic activity really gets going. If canned beans are a must, look for those in non BPA tins. 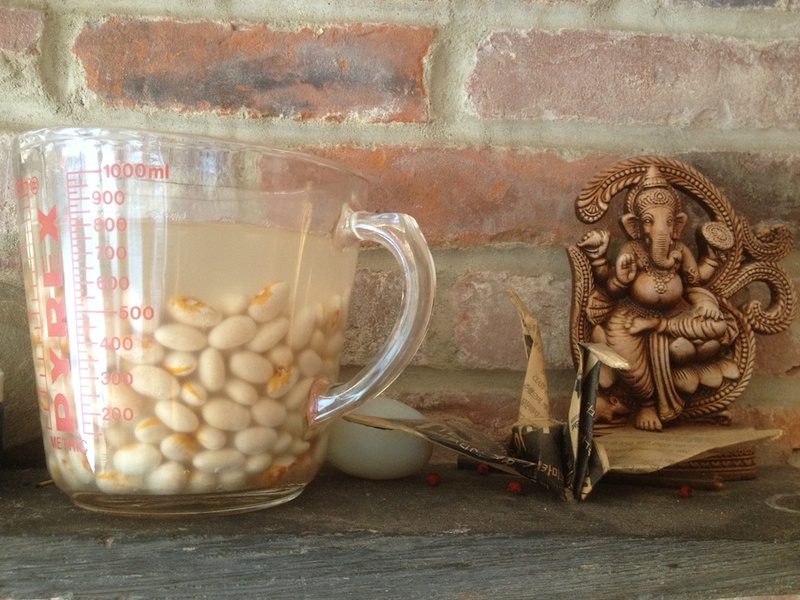 Soak the beans in 6 cups of water overnight along with 2 tablespoons of apple cider vinegar. Keep in a warm area and allow to soak for 8-12 hours. Drain the water, then rinse well. Return the beans to a pot, cover with water, then cook until tender, about 20 minutes. Drain, rinse, then allow to cool to room temperature. Peel the garlic, then slice thin. Heat a large skillet with the butter and half the olive oil. Add the garlic and cook until golden brown, stirring often and prevent the garlic from burning. Add the beans, toss to combine, then continue to cook until heated through. Add the chopped kale, add a splash of lemon, then cover and allow to steam until wilted. Season with sea salt, black pepper and a few pinches of red pepper flakes then drizzle with quality olive oil before serving. Enjoy!